This beanie features the “textured acorn” pattern, in the body of the work. I found this stitch in a very old knitting book and it was called the Acorn stitch. But after a bit of searching, I discovered that it is now called the Textured Acorn Stitch. I created a ribbing that is unique in order to work congruously with this pattern. It is a bit tricky, so pay close attention to your stitches. 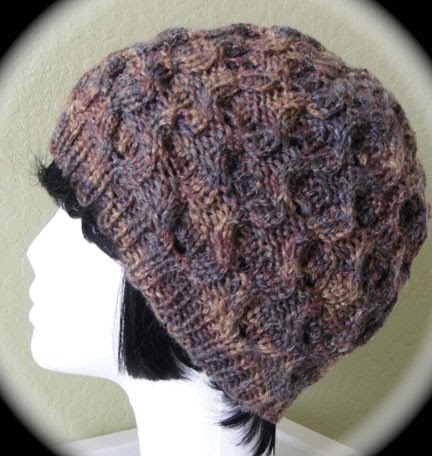 Because this pattern produces a very stretchy material, you can go down a size and still have a hat that fits. And it means a beanie will still fit a child through quite a few years of growth. This pattern has a 10 stitch repeat, with the main body repeating from 1 - 2 or more times. This makes the pattern adaptable to various weights of yarn. Just do a small swatch (in the round) to get a better idea of how many repeats you will need. When following the written instructions only, it will be easier if you place stitch markers (sm) at the end of each of your main pattern rounds, and also right before the decreasing rounds, as the instructions change round count. The chart and it’s instructions are color coded, but also numbered should you print out the pattern in black and white. I enlisted the aid of a few Ravelry friends in finalizing this pattern. It has been a long time in the making. * Special thanks to all and especially “Jadee” for her dogged perseverance, editing and very helpful advice.